Wanted to play along with a few challenges today and managed to combine three with this design. Don’t you love when that happens? I’m really hooked on this reverse stencil technique. I simply inked up my stencil, misted it with water and then placed it on some watercolor paper. Then just stamped the floral image, which really mimics the stencil pattern. A simple stamped sentiment and done! Easy peasy…quick as a wink! Oh, this is gorgeous! I love your fabulous take on the sketch! I have never seen the reverse stencil technique before, but I love the effect……beautiful! Thanks for joining us this week at Just Us Girls! 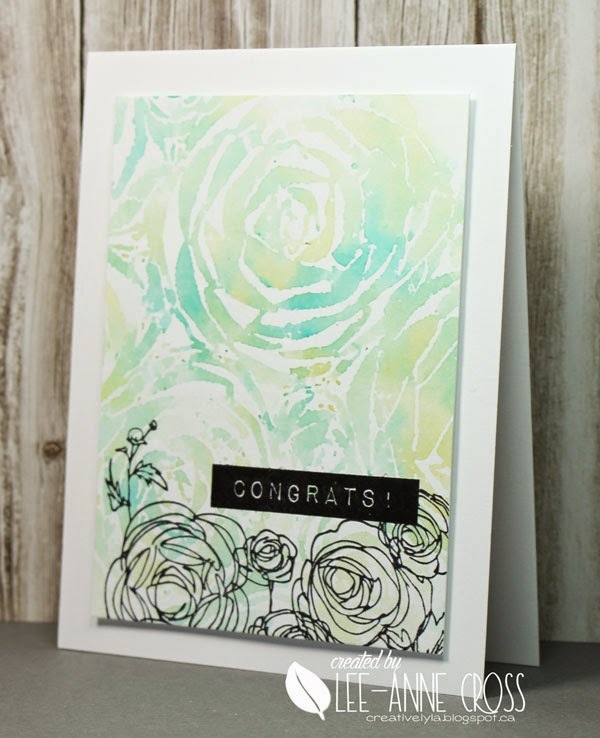 Oh my a winning beauty 🙂 Love the stencil and the softness of colors ! Stunning!! I just adore black with pastels — this is amazing! Thanks for joining in with JUGS! Oh, WOW!! I have never done that reverse stencil technique, but I absolutely LOVE it. It looks like watercolor, which I'm addicted to anyway. Your card is FABULOUS!!! Thanks for playing along with us this week at Just Us Girls! Beautiful!! I like tte colours, the image and the implementation!! A totally beautiful card Lee-Anne and so elegant. Love the colour choice too. Love the effect of repitition but not duplication. And of course the colours are lovely. Like a Monet watercolour!